This Tuscan Garlic Chicken tastes like it came straight out of a restaurant and is one of my personal favorites! It is packed with flavor, and with only 7 ingredients and one casserole dish, you can whip it up and have it in the oven in as little as 15 minutes. The layers of tender chicken, flavorful garlic, and wholesome spinach, artichokes and sun dried tomatoes give this dish so much delicious flavor that this recipe will make an impression to last. This is the perfect meal to make for company since it is easy to prepare but made to impress, but it is simple enough to also be great for an everyday family dinner. And the leftovers… if you have any… are possibly even better reheated the next day. Today I am sharing with you one of my all-time favorite recipes! The first time I made this dish, it was something that I threw together because I had some things in the fridge that needed to get used. I wasn’t expecting much, but this was 100% love at first bite. My friend Emily was over and she agreed that this was the best thing we had eaten in a long time. So if you are here, I am begging you to add this to your menu ASAP! You shouldn’t live without this delicious dinner in your life! It is easy to get a quick recipe, or an easy recipe, or one that has fast clean up, or a recipe that is SO DELICIOUS, but let’s face it… it is pretty hard to get all four. This my friends is a home run! Having a recipe is one thing, but putting it together into a whole meal is another. I know what a challenge it can be so I always like to offer some of my favorite serving suggestions so that you can put together something easily that you can love and feel proud of. Since this recipe is low carb by nature, it can be paired with a starch to really round out the meal, or you can choose low carb options to pair it with to keep things low carb overall. I have plenty of ideas for both! I like to combine 2-3 of these sides with the chicken to make a well rounded meal that gives everyone something that they enjoy. If you serve this dish with something not listed, please let me know in the comments. I would love to give it a try! I am going to walk through this recipe with you step by step to give you all of my tips and notes to get the best out of this dish. If you have questions, there is a good chance I will answer them in this section, but if not, feel free to leave me a note in the comments section below. If you want the quick version of this recipe, feel free to skip down to the full, printable recipe card below. 2 lbs boneless, skinless chicken breast– This is usually about 4 chicken breasts depending on size. If you get thick ones, you may want to slice then in half so they are thinner which will allow them to cook more quickly and evenly. 2 cloves fresh garlic- I myself am guilty of using jarred garlic in many recipes, but this one is so simple, and it really does make a big impact on the flavor, so I really encourage you to use fresh here. Just put it through the garlic press and rub it on the chicken. Easy enough! 2 oz fresh baby spinach- This doesn’t sound like much, but it is about 2 big handfuls. If you really like spinach, you can load it up with even more. When it cooks, it will wilt down so much that even if it looks like a lot now, you have room for much more. 1 can artichoke hearts, drained- I get these on the vegetable aisle and generally use the regular canned Progresso artichoke hearts. This is a 14 oz can, however the drained weight is 8.5 oz. I drain all of the liquid from the can so all you will be using is the actual artichokes themselves. If you can only find artichokes marinated in herbs, that won’t impact the flavor much since we are draining them, so you can go ahead and use them, although I always just buy the plain ones. Also, I like to chop mine up a little if I can’t get quartered artichokes. 1 jar sun dried tomatoes, drained with 1 tbsp oil reserved- You can usually find these either near the olives, with the vegetables, or in the specialty foods section. You will find a variety of options here just like the artichoke hearts. I used halved sun dried tomatoes that were in plain oil, but again, if you can only find them marinated in spices, it will work. I like to chop up the sun dried tomatoes quite a bit since they can be kind of chewy. It just makes it easier to eat, especially if you are serving to kids. 1 cup mozzarella cheese, grated- I use regular grated mozzarella in this Tuscan Garlic Chicken recipe, not fresh mozzarella. Once I ran out and made it with the Swiss-Gruyere blend they sell at Trader Joe’s and that was also amazing if you want a twist! Can I use chicken tenderloins, chicken thighs, etc. instead of chicken breasts in the Tuscan Garlic Chicken recipe? Yes! I prefer chicken breast which is why I use it, but the flavors will work well with any kind of chicken you would like to use with it. If you do change the type of chicken, the cooking time will likely also change so keep that in mind! Can I use frozen spinach, jarred garlic, or other non-fresh ingredients as a substitute for the fresh ingredient? I specify fresh spinach and garlic in this recipe because I think that those both impact the flavor when cooking. Yes you can try it if you are in a pinch, but it will likely alter the taste of the Tuscan Garlic Chicken somewhat. Do I cover the casserole dish while cooking the Tuscan Garlic Chicken? In most of my baked chicken recipes I prefer to cook uncovered because it helps to burn off some of the liquid that is released from the ingredients while cooking so that the dish doesn’t end up too watery. With this recipe, I have found that since the sun dried tomatoes are already void of most of their liquid they can get a little crispier than you probably want if you bake uncovered the entire time. So to try to get the best of both worlds, by starting the dish uncovered and then loosely covering it toward the end so that the steam can still escape but it will protect the toppings from getting too browned. Can I add more cheese, veggies, or something else to the Tuscan Garlic Chicken? Absolutely! Cooking is really the art of creating flavors that YOU love, so if you love things cheesy then throw on some extra cheese. If you think everything is better with capers, then put some of those in. If you are obsessed with spinach, or garlic or artichokes then you can double it! This recipe is really forgiving as far as you being able to add, subtract, modify and adapt it, so don’t be afraid to put your own spin on this Tuscan Garlic Chicken. What are the Weight Watcher’s Freestyle Points for this meal? Tuscan Garlic Chicken has 2 SmartPoints for the Weight Watchers Freestyle program. What do I do with the Tuscan Garlic Chicken Leftovers? There are many ways you can make this dish your own, both the first time you eat it and when you prepare the leftovers. No matter how you make it, I hope that you enjoy this Tuscan Garlic Chicken as much as we do! This Tuscan Garlic Chicken tastes like it is straight out of a restaurant kitchen, but is so simple to make! It has layers of bold, delicious flavors with the spinach, artichoke, sun dried tomato and, of course, garlic. This meal is perfect for entertaining or just a night with the family. Lay the chicken flat in the bottom of a large casserole dish. Season with salt and pepper then press garlic and spread it evenly over the chicken breast. 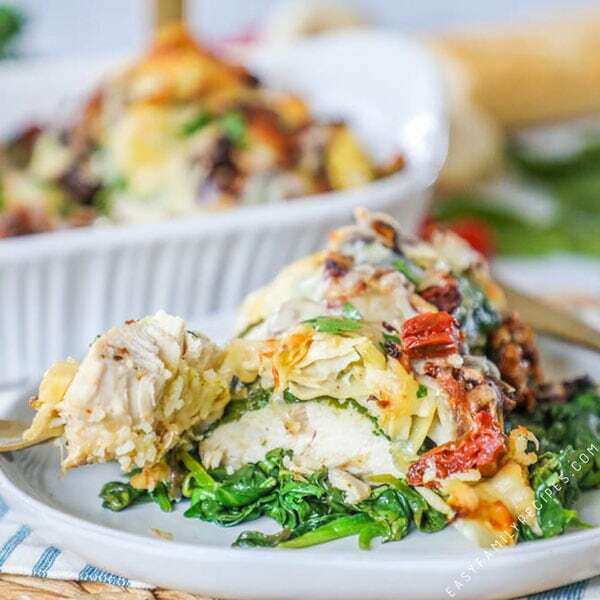 Place the spinach, artichoke hearts and sun dried tomatoes on top of the chicken and then drizzle the tablespoon of oil reserved from the sun dried tomatoes. Finish by topping with mozzarella cheese. Bake for 45-50 minutes total. Cook 20 minutes uncovered then loosely cover with foil for 25-30 minutes or until the chicken is cooked through (165˚F internal temperature). Don't forget... if you make one of my recipes I'd love to hear from you in the comments or tag me on Instagram @easyfamilyrecipes so I can see what you are cooking up! This recipe is naturally gluten free, for a dairy free version you can omit the cheese. Wow! This sounds delicious but what led me to comment was your inclusion of serving suggestions. Thank you, thank you, thank you! Often I find a great recipe and have no idea what to pair it with, so including these suggestions just made my day!! Thank you so much Dianna! I really appreciate you taking the time to comment and tell me that. I didn’t use to do the serving ideas but so many people asked that I really thought it was an important part of the value I give so I started integrating it into every post. I hope you find many meals you and your family will love here! I agree!! Thank you for the side dish recommendations!! Made this for dinner tonight and served it over quinoa. We have a breast and a half left over, I plan on cutting them up and making a pasta with it later this week. After years of discomfort after eating, I recently learned I am a celiac, I worried my family and I would suddenly run out of yummy foods to eat. I am so grateful for healthy solutions like this that can be served with gluten free options! love it! this is a great recipe, apart from tasting really really good, it’s wonderful to have a recipe that is versatile. I shredded up the chicken and made it into a wrap for lunch the next day. I made this recipe for dinner today. It was delicious! My husband loved it too. Thank you for this great meal idea. I will be making it regularly in the future. There was a lot of liquid at the bottom of the dish even though I had drained the artichokes and the sun dried tomatoes. Has that been your experience as well? It will definitely have some liquid in the bottom at the end. Both the veggies and chicken will release juices as they cook. I find that some chicken has added solution in it so that it looks more plump. You can find this in the fine print on both fresh and frozen chicken. I try to get the lowest amount possible which also helps a bit. 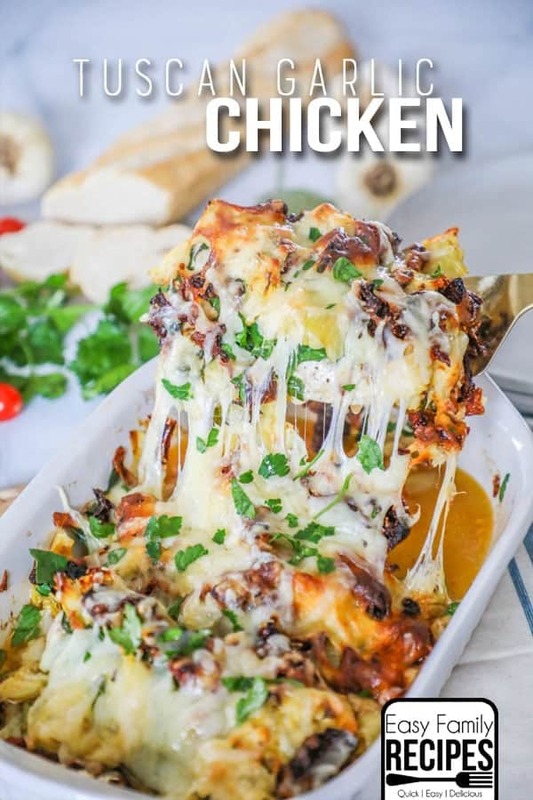 I usually serve the chicken and if it is on pasta or rice, or something that will work well with the juices, I spoon a couple of spoonfuls over the the top. I hope that helps some! Hello! Can I use cherry tomatoes instead of sun dried? I’m making this tonight for the first time and serving with gnocchi and salad. I cannot wait to try it! What could you substitute the sundried tomatoes for? Fresh tomatoes? You could use fresh or roasted red peppers. Or you could leave them out all together although they give the dish a lot of flavor! I’m not a huge fan of regular sun dried tomatoes but I do like them in this dish. This recipe had really good flavor, however cooking chicken breasts for 45 minutes was way too long and they came out overdone. Will try it again but only cook 25 minutes next time. Hi Mel- I am glad you loved the flavor. It is really hard to give an exact baking time since the main thing that will determine the amount of time that the chicken needs to cook is how thick the chicken breast is. Since some are thin and others can be super thick there can be a lot of variation. I would definitely recommend adjusting the time based on how thick the chicken is and how your oven cooks. I made this tonight for my husband and it is now his absolute favorite meal! Easy and DELICIOUS. Thank you for sharing! What is the size of the jar of sun dried tomatoes? It is 8 oz. Apologies! I will get that added to the recipe. When I put this recipe into the WW recipe builder, I used 1 chicken breast per serving and it came out to 7 points. The sundried tomatoes are packed in oil and then with the cheese. How does your recipe come out to 2 WW points? Hi Kathy- I calculate the serving size on a 4 oz piece of meat which is standard for a serving size of chicken and would usually equate to about half a chicken breast. Thank you! I made it the other night and it is delicious. I will def make again. I was wondering that exact same thing!! Can this be made into a freezer meal? Made this using thighs instead. Was very tasty. Oh that sounds delicious! You will have to let me know how it goes if you get to try it! I ended up roasting it in the oven. Diced onions and garlic on the bottom, topped with spinach. Placed the whole chicken on top. I added the artichokes around the chicken and the sun dried tomatoes. I did sprinkle the chicken with garlic powder and paprika for some colour. I also grated in a bit of garlic as well. Served with grated Parmesan (as I was out of mozzarella). I would definitely do it again. I have dried, sun dried tomatoes in a pouch, not the marinated ones…is there anything I can do to use those instead? Straight substitution? Or should I soak them in a little olive oil first? I have never used these in this recipe but I think soaking them in a little olive oil would be the way to go since it will help keep them moist during cooking as well as carry their flavor throughout the dish. Made this recipe tonight, loved the flavor, super easy and was a pretty presentation. So excited to try this for a dinner this week! I’m thinking about trying it in the slow cooker – have you done that before? What are your thoughts on how it may/may not alter the flavor? I think it would probably work really well! I would definitely leave the cheese off and just throw it on at the end with long enough to melt. Let me know how it goes! I made this last night and it was a huge hit. The entire family loved it, even my 10 year old. (Granted he is not picky and will eat just about anything.) I did make a few changes after reading the comments. I mixed the spinach, sun dried tomatoes, artichokes and oil in a bowl before adding to the chicken. I also cooked covered the entire time and added the cheese at the very end. My husband said this is his new favorite meal! Completely bland as written, and I salted and peppered the chicken well. Completely disappointed. Going back to my creamy tuscan chicken recipe. Delicious, and very versatile. Always a family request! Thanks for the recipe. I am going to try this tonight using kale and savoy cabbage instead of spinach and artichokes. Sides of sweet potato wedges (homemade) for us on low carb and roasted new potatoes for my son. Looking forward to tasting it later! Really easy to make and a big hit! Will make again! Question- never heard of grated mozzarella- can you use shredded? Looks good! Will try soon. Hi Alison- It is the same thing! You can use pre-shredded mozzarella or use a block and a cheese grater. Wow. I made this last week and it was so good I made it again this week. My husband is raving about it. He can’t believe it’s homemade! And I can’t believe how quick and easy it is. With a 2 year old and a 5 month old, 2 jobs, and working on a graduate degree, I won’t cook anything that needs much prep. This dish is my new go to! I already had sundried tomatoes in a pouch … so that’s what I used. Since I didn’t have the oil from the oil packed tomatoes, I drizzled the entire dish with a lemon flavored oil before baking. The additional lemon flavor was amazing! LOVE how easy and delicious this recipe it. Thank you! Made this tonight and it was a big hit. Used chicken tenders, which made it easier to serve. Served over buttered fettuccine and spooned the yummy pan juice over the pasta. What a great post! I usually just go straight down to the recipe with instructions but something caught my eye with your post and I started reading. I loved all the ideas for leftovers and sides and also with the ingredients you used. I’m thinking this will be a great lunch meal prep for me with the veggies. I’m a happy camper over here! Thank you Heather! I put a crazy amount of time into these and really try to give helpful ideas so it is extra nice to hear your kind words! I hope you enjoy the Tuscan Garlic Chicken and even find some more recipes you like on the site! Wonderful recipe. And really easy, too. I think those sun dried tomatoes and the artichoke hearts added such amazing flavor. I am a WW member and on the Freestyle program I calculated this at 4 delicious Smart Points per svg. It is such a keeper that I have already put it on a card in my recipe box right after dinner tonight. THANK YOU! One clarification for those who might be interested – I used PART-SKIM mozzarella not whole milk and plugged the ingredients into my WW app, not the nutritional info, to calculate the Smart Points. Again, such a good recipe! Very yummy! I butterflied the chicken breasts to cut down the cook time and served with mushroom rice pilaf. Family loved it! Delicious!! Made this for dinner tonight with enough for leftovers tomorrow. I added extra spinach and didn’t make a side with it! I will be adding this to my dinner rotation!!! Made this for dinner tonight and I am loving it! Added some mushrooms as the husband and I love mushrooms. Served over Cauli Rice (he’s diabetic so I’ve been looking for something thank you for the suggestion). I feel like the flavors all blend well! I used can stewed tomatoes instead of sundried. Came out great. Making again tonite! Do you think this could made into a freezer meal? Juicy and delicious! So simple, and yet it feels fancy. I’m going to try it next time with portobello mushrooms instead of chicken just to mix it up. Thanks so much. Can’t wait to try your other recipes. So glad you enjoyed it! I think portobello is a great idea! Enjoy! This was fabulous!! I added a couple of extra cloves of garlic and a few more handfuls of spinach. I butterflied the chicken because the breasts were very thick and I was afraid the chicken would be dry and tough. I served cauliflower risotto with asparagus tips on the side. This is definitely a keeper!! Can I prepare ahead and store fresh spinach on chicken until I bake it? My 14 year old made this last night (he didn’t like I because we found he does not like the sundried tomatoes or artichokes lol). I LOVED it!! However, I was wondering if you could please confirm something. The directions said to add the cheese and cook w/out a cover. After 20 mins had lose foil. At that 20 minute mark the cheese was already over done. Would it be better to add the foil for the first 20 mins, then remove for the last few? Or maybe add the cheese at the end? We didn’t have any liquid in ours and our cheese had burnt/crunchy pieces on the pan (I admit, I really liked that haha). Can’t wait to make this again. Sounds yummy and would love to try. Only thing throwing me off is it seems it would be in the over for over an hour??? Any reason for this. My chicken usually cooks in 20-25 for chicken breasts. Mine usually cooks for about 40-50 minutes. It will depend on how thick your chicken breasts are and the time can be reduced by cutting them thinner. Since there are quite a bit of toppings covering the dish it takes the chicken a bit longer to cook through . Very good! I modified the recipe to fit my weight watchers diet, and it was very flavorful. I felt like I was cheating. I just had the Tuscan Garlic Chicken and loved it. In preparing to make this dish for Sunday Dinner, I made a few alterations by eliminating the artichoke hearts, and using a garlic clove but garlic salt, but I followed the rest of the recipe. I loved the combination of Spinach, Sundried tomatoes and slice Cheese. I used the Perdue Perfect Portions, from the Heartland, and I reconstituted some sundried Tomatoes in some olive Oil, the night before, and used an Arugula and Spinach mix. Great recipe. I changed a couple of things; I seared the chicken in the sun dried tomato oil for about a minute on each side and then sautéed the garlic, artichoke hearts, spinach and sun dried tomatoes for a couple of minutes sldo in the sun dried tomato oil for a couple of minutes before adding it to the chicken and then finishing it in the oven. I skip added a little Parmesan cheese. This is really good; juicy chicken and not too much cheese. I did add additional garlic just because we like it and a pinch of oregano. Adding this to our repertoire, next time I will add extra spinach. So easy and delicious. I just made this and the cheese was burnt within 5 minutes of being in the oven. The directions do not say to top with cheese at a later time. I pulled it out and covered it with foil and am hoping for the best, but if it doesn’t come out that is a lot of money and food wasted. I am wondering if this can be made up in advance? We have a large group of moms and I am always looking for good meals to drop off for those post partum days. I usually make up a one dish meal that they can bake whenever they are ready for dinner. I made this for my family and it was a hit! Delicious, quick, healthy, and easy cleanup. What more can you ask for?! Thank you!! Making it again tonight for the second time! Delicious and so easy to prepare. I love it served on a bed of garlic mashed potatoes. Very yummy and quick to throw together. Thank you for sharing this. It’s becoming a every other week dinner around here. 1st, why do you people have to say what you changed? It’s not your blog! And 2nd, I LOVE this recipe (my picky family not so much – their loss). Don’t you think this would work in the crock pot? I made this dish for my boyfriend and it was amazing! He always enjoys the meals I prepare, but he could not stop complimenting this dish. Thank You for an amazing dinner recipe that was quick, easy and better than a restaurant meal! I will be making this again!!! Unfortunately this dish didn’t please my family. I wanted to love this dish but we didn’t care for the taste. Bland and boring despite seasoning with salt and pepper. This was absolutely wonderful! I made it with chicken thigh instead and mashed potatoes on the side for the guys so that I could keep the keto portion available for me. Definitely making this again, thank you for sharing!!! I was having family and friends over and so as to not have to be over the stove cooking while entertaining, I wanted to find a recipe that was baked and found this. One thing I noticed that there wasn’t sauce produced while baking. I therefore added 3/4 to 1 cup of heavy cream, about 2 tablespoons of butter and about 1/2 cup of fresh grated Parmesan cheese. There was a very nice amount of sauce when I served (with pasta). Very favorable! I made this recipe today and it was delicious! 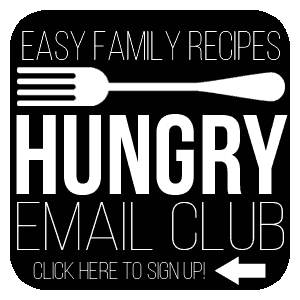 I’m signing up for the email so I can get more great recipes! I made this last night. I usually have to tweak recipes, but I made this one strictly by your recipe. IT WAS DELISH! Thank you so much! Will definitely make this again! The flavors were good on this but cooking it for 40 minutes (20 + 20 covered) resulted in really rubbery chicken. It was close to inedible. I made this tonight. We really liked it. This will be on the regular rotation for easy weeknight meals. I served it as is no additional sides. It was great, as is. awesome is an understatement!!!!! I cant wait to make this again…and yes, it was just like a restaurant! This Tuscan garlic chicken was amazing! My husband and girls gave it a 9 out of 10! Made this tonight and it was a wonderful hit in our house!! I bought 2.5lbs of chicken and sliced them in half so there were more servings and it cooked faster. I split it up into 2 dishes so we would have a good amount of leftovers for tomorrow’s meal (feeding a family of 5 adults!). We love spinach, artichoke hearts and cheese so I probably added more of all of those. Served it with roasted cauliflower. One thing I did that everyone loved was use some of the oil that comes with the sun dried tomatoes and cut up some rye bread (cause that’s what’s what we had!). Spread a little of the oil on each slice and sprinkled some garlic powder on top and broiled for a few min. Was very very tasty! We will be having this dinner again! I made this as written and it was amazing, Will definitely make on the regular again. Very pleased with the nutrition as well. I tried this recipe as written for dinner guests, it was delicious! Many compliments and my husband who will tell me the truth really liked it! He was making faces when I was putting it together so I thought he wasn’t going to like it. It’s a keeper! Simple yet elegant. Thank you for sharing such an awesome recipe! Can you use fresh mozzarella? You specifically call out the other so wanted to make sure . Made this for dinner tonight, super simple and so delicious!! Will definitely be making this recipe on a regular basis, thanks so much!! I did this exactly as written and it was fab. My hubs., Kids 9 and 7, and I loved it. It’s so simple to make. I sliced my large chicken breast into two thinner pieces and got 6 decent portions out of one recipe. I’ll definetly make again! Absolutely lovely dish- healthy but feels sinful. I have made this with both spinach and then when I next made it forgot I was out of spinach so used asparagus that needed used up and it was excellent. Even our daughter who hates all things not pizza devoured this and then asked me if I could show her how next time I made it. Thanks for this awesome recipe! This dish was amazing. Very tasty and delicious. I served this with baked sweet potatoes and a salad. Thanks for the recipe!